Imprint your logo on these handy 12 oz. collapsible bottles and make a lasting impression. Our collapsible bottles are great for school lunches, hiking, or just about any place because when they’re empty they collapse flat for compact storage. 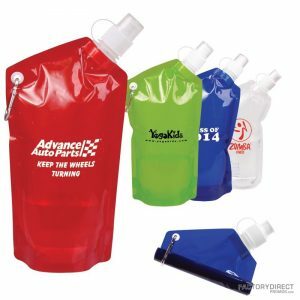 These custom wholesale water bottles are sure to be hot items at trade shows and they will remind your clients of your brand every time they take a sip. 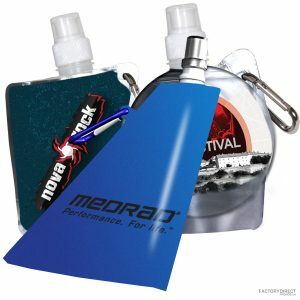 What’s more, these bottles feature a carabineer clip so they can easily be attached to a backpack or bag, allowing your clients to put your logo on display. We work with the factory to keep prices down and we also afford you the chance to completely design your own reusable custom water bottle. Check out our overseas production for additional info.